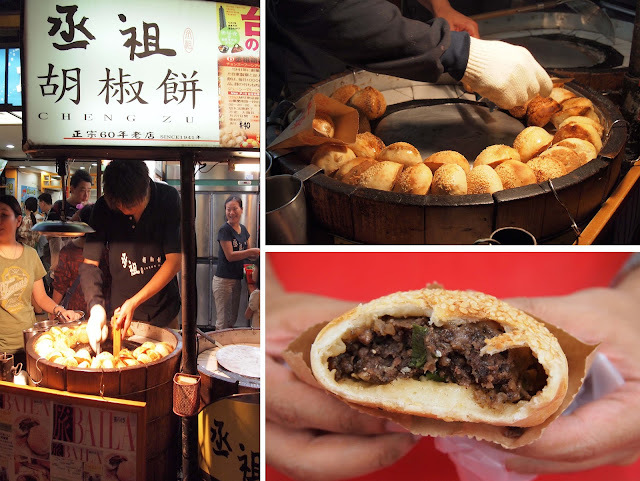 Ah ... the land of street food, Taiwan! When I think of street food, no other country comes to mind besides Taiwan (well, maybe Korea too now that I've been), and the night markets in Taipei come stock to the brim with all manner of food stuffs - some sweet and tangy, some piping hot in a bag, or some crunchy delight on a stick - but they're allllll good. Our first stop to ease our hunger pangs from a morning flight to Taipei is Shida Night Market which is about 15 minutes walk from our hotel. We did our due research beforehand reading this wonderful post - the rather useful map can be gotten there. The one biggest thing I wrote down to try was the lantern stew, or 燈籠滷味, which we glad to find after a few twists and turns. Utterly confused on how to order, I started queueing before being shoved a basket where I was supposed to pick my food first. Lovely selection of animal parts, noodles, veg, beancurd, meat, tendons ... gah so much to choose! The aforementioned blog mentioned the noodles as must try so I took one. Large intestines is another personal favourite in Taiwan, and after a few more items I realized I took too much. After paying, you queue for the guy to cook it, then let him if you wanna eat in when you collect. There's a minimum drink charge if you eat in, so just get two drinks and you're set. It's like an imba version of yeung tau fu, everything's stewed in this wonderful braised sauce. And this huge hefty plate enough for 3 cost us only $8! The giant mushrooms and pork tendon were great, as were the noodles which were like chewy maggi. T'was delicious but sadly we overestimated ourselves and we were full just after one dish. 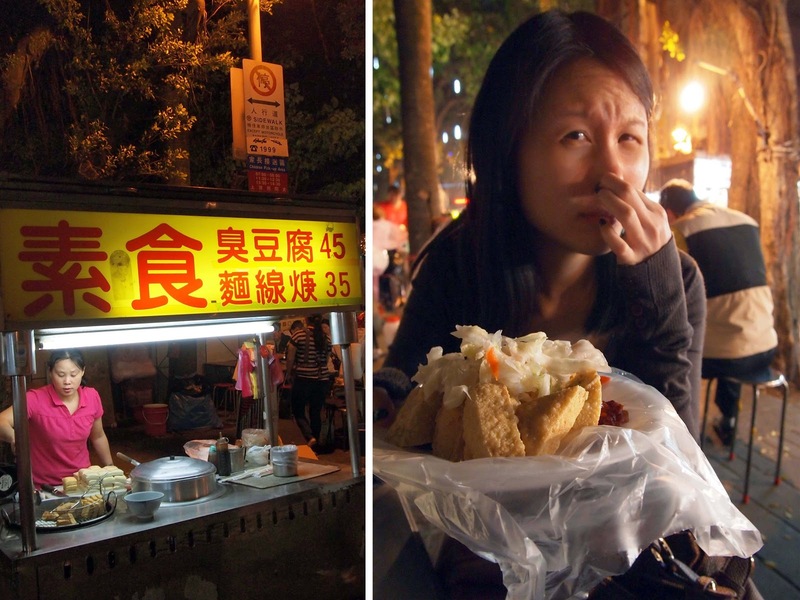 Street food is all about eating many little things! So we were kinda disappointed we didn't have more stomache that night. We did have space for crepes though, and back to this popular Arnott's Crepes where they were selling helm sized crepes for cheap! Not a stickler for whipped cream and too full to try anything heavier, we got a plain one with blueberry jam. The crepe itself was great - just a tad crispy and a lot eggier than other inferior ones I've had in Singapore. Very generous with the jam too (think we paid about $2 for that). 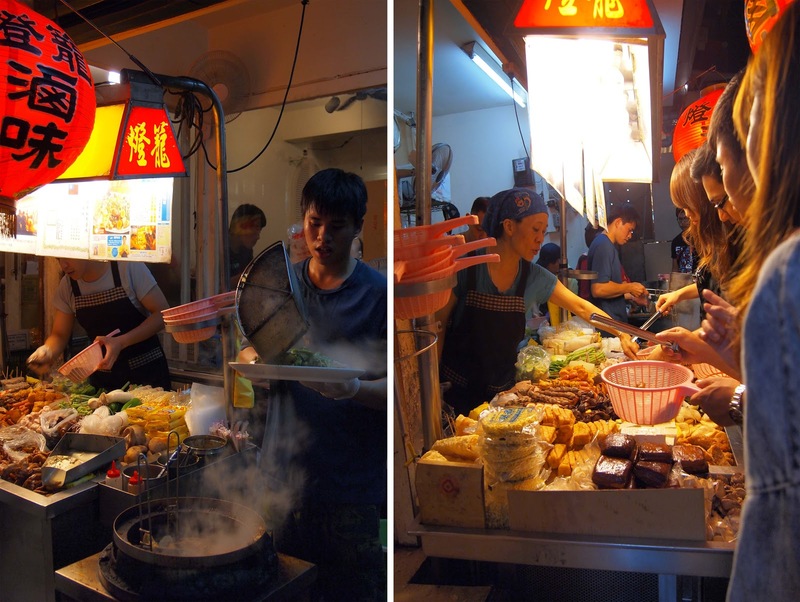 Arguably the most popular night market is Shihlin Night Market, I don't think it's the biggest and it's certainly considered to be. They have a slightly wider variety of food (if you can find it) - do go in from the main entrance which is diagonally across Jiantan MRT Station. Big sausage wrapped small sausage (大腸包小腸) - my initial fear was big intestines stuffed with small intestines (sounds disturbing but would actually be quite tasty), but it wasn't so - what it was is just a rice sausage MacGyver-ed to a taiwan sausage with some vegetables. The rice sausage was overly heavy and I thought it was overly extremely oily and hard to eat! One of my personal favourites, BBQ quail eggs with some tender loving sauce. Five in a stick for 20NT (just under a dollar), it's a cholesterol-filled trip to heaven with every pop. The original (?) hot star giant fried chicken still exists in Shihlin, though you can get it in Singapore now (City Square, Serangoon NEX, and Tampines) but friends tell me it's still not as good. The main difference from others you can find in Singapore is that it's a single giant piece (including some bone at the end) and they don't chop it up for you. And of course, it's fried to golden goodness, at less than 55NT ($2.50) a piece. Do give the standalone taiwan sausages a try as well - remarkably different from the poor ripoff in Singapore. Those made from wild boar meat are about 5 times better as well - not sure if you find those in Taipei but they were common in Cing Jing. 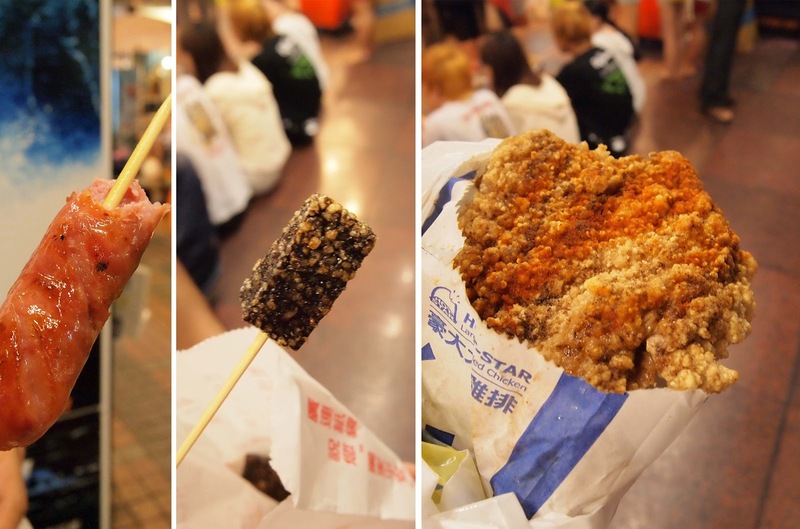 The holy trifecta of street food as I like to call it ... taiwanese sausage, pig's blood rice cake, and giant fried chicken! What I previously thought was a specialty only found in Raohe, charcoal baked pepper buns (胡椒餅) are now pretty common all over. Crusted with a ton of sesame, the thin cripsy bun skin gives way to a lovely blend of pepper, pork and spring onions. Just be careful cos it's piping hot! 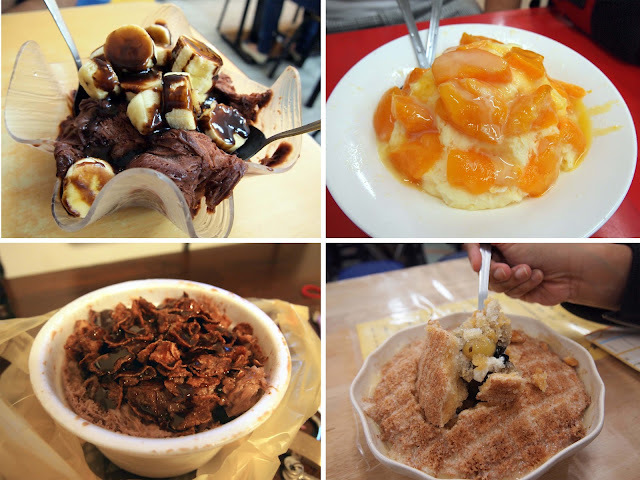 Shaved ice or 刨冰 was surprisingly different to find this time round! But if you're willing to look, there's still some to be had! Weather was generally cold, but we still couldn't resist. 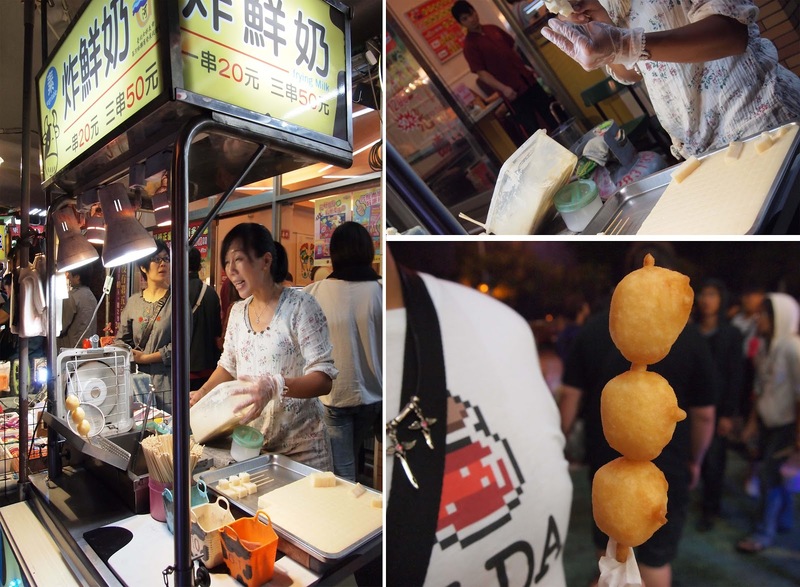 Definitely the most surprisingly street food I had, it was literally fried milk! Frozen milk, fried. Melts the second you bite it open, into a glorious custardy cream. My brave finally keeled and agreed to share a plate of stinky tofu with me! While smelling like rotten corpses, the fried ones are awesome - there's only a slight fermented tinge beneath the crispy exterior, strengthened with sweet chilli. 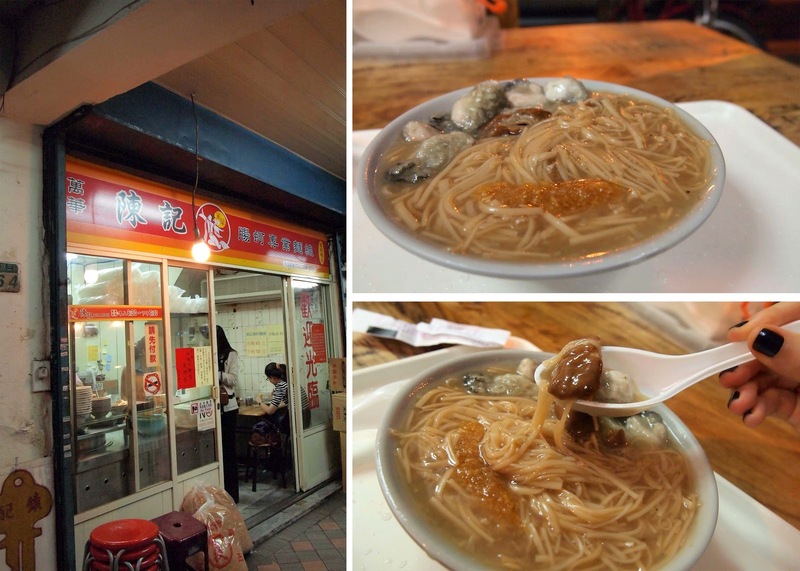 Not exactly street food, but definitely one of the most popular - oyster mee sua (vermicelli)! Supposedly better than the popular Ah Zong, this standalone near the Longshan Temple station serves mee sua with both large intestines and generous oysters! The portion was generous, and a mix of the oysters, large intestines, garlic and trademark chilli (do NOT eat it without chilli!) really gives it a much richer, fuller taste than Ah Zong! We arrived around 730pm on a Monday and there was no queue, though it seems sometimes there is.